We believe in providing a professional house cleaning service for our customers and shown below are some samples of the testimonials that clients have sent to us. Please pass on my appreciation to Amy, who is a ray of sunshine and is a wonderful human being, Thank you for the excellent service and care that has been shown towards me. Many thanks for all your help. Excellent service received. Many thanks for your friendly and professional services. Many thanks, you have been a great help and I've had no hesitation in recommending you to friends. 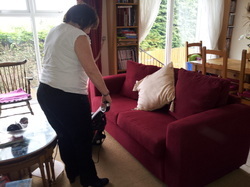 We have been extremely pleased with the quality of cleaning. I thought I would take the time to quickly write and let you know how happy my housemates and I are with our cleaner, Denise. It is a pleasure every week to come home to a clean and tidy house. Denise does a splendid job of cleaning the house. We have had independent cleaners before and I have always been disappointed with them. We’ve had Denise coming for the past 3 months and I certainly see this continuing for many more to come. She does a fantastic job of cleaning, but also tidies our house up always leaving it looking smart. When the house isn’t particularly messy she’s taken it upon herself to do ironing and other bits and bobs around the house to help out. She’s been a fantastic help and I wanted to take the time to let you know how pleased we are with the service. Thank you very much indeed for putting us in touch with her. I would like to take this opportunity to thank you for your professional and reliable service and the excellent cleaner that you introduced. The cleaner you introduced to us has been an absolute gem - she gets more done in 3 hours than I would get done in a whole day and she is really efficient and cheerful. Jayne did a fantastic job yesterday. I would like to say thank you to you and to the two cleaners especially who cleaned my house yesterday. I came home after a 15 hour workday and was pleasantly surprised at the great job they did in such a short space of time. The cleaners you introduced were excellent.